A majority of these listed companies include banks and financial institutions (BFIs), and insurance companies who are in a rush to raise their minimum paid-up capital requirements set by their regulators. As BFIs have to meet the new paid-up capital requirements by mid-July, they have sought the Sebon's final nod to float additional shares to their existing shareholders. While the Nepal Rastra Bank (NRB) had raised the minimum paid-up capital requirements for BFIs by multiple times two years ago and told them to meet such requirements by mid-July this year, the central bank is allowing them to adjust the capital requirement through the rights issue that are in the pipeline. Mega Bank Ltd, Civil Bank Ltd and Prabhu Bank have the highest number of rights shares in the pipeline. With 10:4 ratio of rights issue, Prabhu Bank aims to collect Rs 2.35 billion. Civil Bank Ltd and Mega Bank have both proposed 10:4 ratio in rights issue to draw Rs 2.07 billion and Rs 2.98 billion, respectively. Central Finance Ltd, Green Development Bank Ltd, Kisan Microfinance Bittiya Sanstha Ltd and Mount Makalu Development Bank are other financial institutions who are raising capital through rights offering. Shareholders of Summit Micro Finance Development Bank Ltd, Excel Development Bank Ltd, Reliance Finance Ltd, Guheswori Merchant Banking and Finance Ltd, and Nepal Community Development Bank Ltd can also expect rights issue. 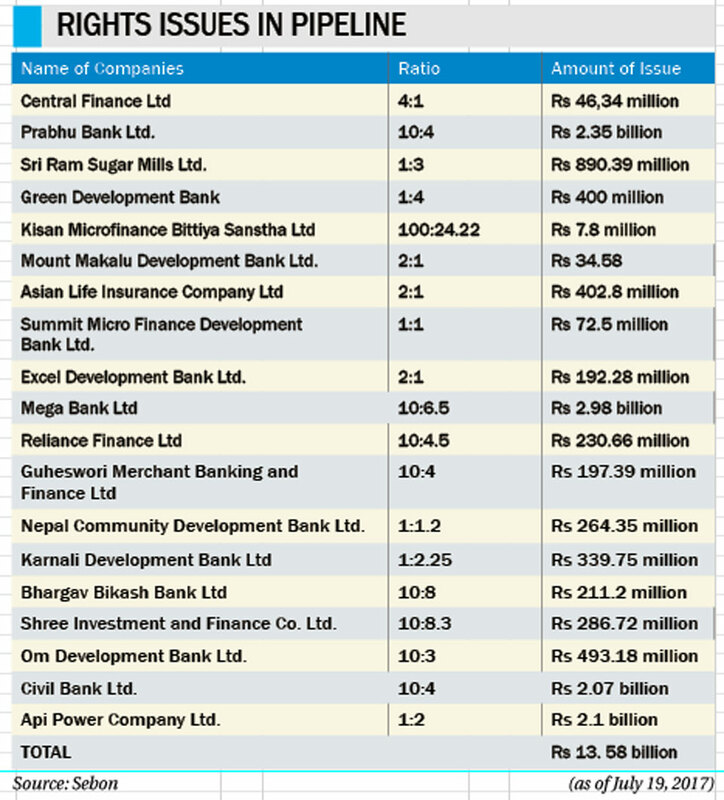 Other BFIs seeking approval for rights issue are Karnali Development Bank Ltd, Bhargav Bikash Bank Ltd, Shree Investment and Finance Company Ltd, and Om Development Bank Ltd.
Asian Life Insurance Company Ltd is the only insurance company that is awaiting the Sebon's approval to float 2:1 rights issue. As BFIs are expected to meet the new paid-up capital requirements in few months, insurance companies will be on a rights issue spree after that, according to financial analysts. They say that the market will be overwhelmed with the rights issue from the insurance companies as their regulatory body, Beema Samiti, has also followed the NRB's suit to raise the minimum paid-up capital for them. Earlier on March 31, the Beema Samiti had decided to raise the minimum paid-up capital requirement for both life insurance and non-life insurance companies by four times within 15 months. Each life insurance company will have to increase its paid-up capital to Rs 2 billion while a non-life insurance company will have to raise its paid-up capital to Rs 1 billion by mid-July 2018. Such paid-up capital floor was Rs 500 million for life insurers and Rs 250 million for non-life insurers. The data of the Sebon shows that Sri Ram Sugar Mills Ltd is also floating 1:3 rights issue to collect Rs 890.39 million in capital. This is probably only one manufacturing sector company in last few years to float rights issue. Api Power Company Ltd also wants to increase its capital by Rs 2.1 billion by floating rights issue at 1:2 ratio, according to the data.